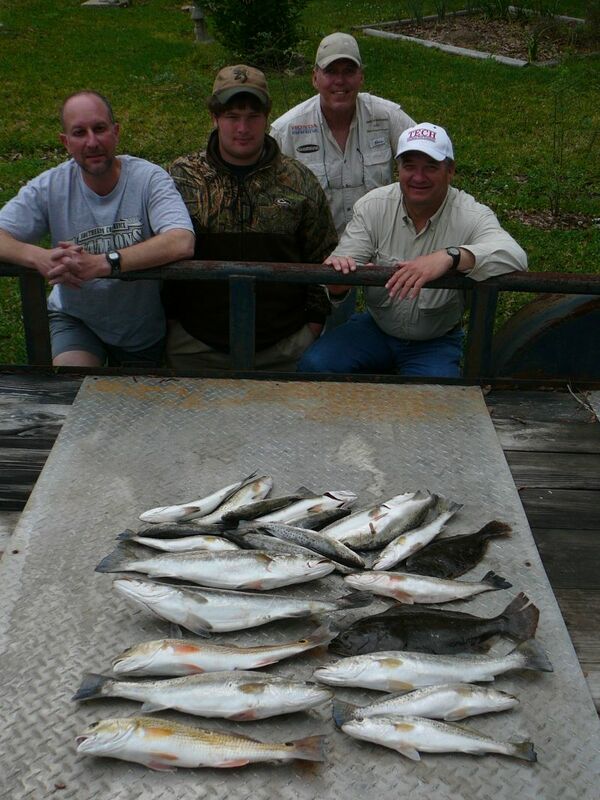 Gary A. of Shreveport, his son Carson and friend David B. Made the 3 hour drive down from Shreveport to catch some nice BigLake Trout. 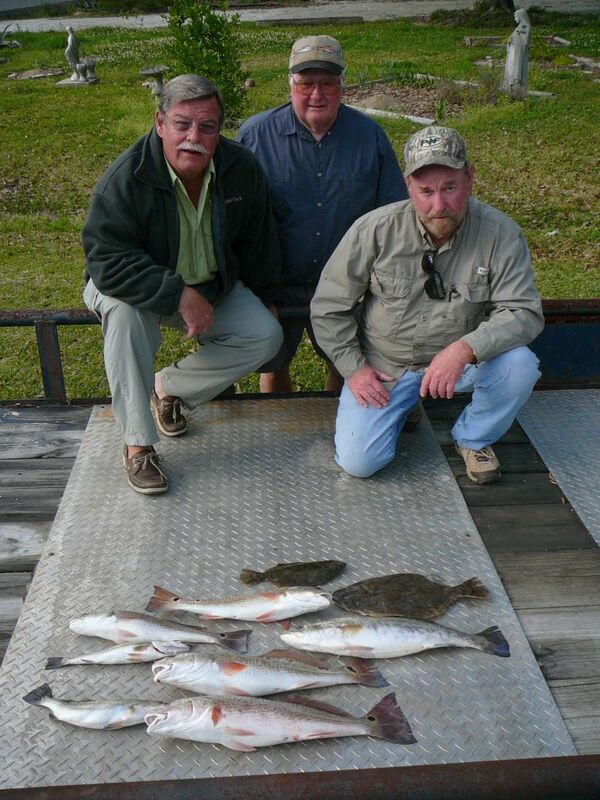 With a few Detours caused by the weather( it was more like July than March with some nasty storms around) they still managed to boat several Trout in the 3# range ( Gary’s were closer to 4 he swears) and added some Reds and Flounder to finish the day with two Big Lake Grand Slams. 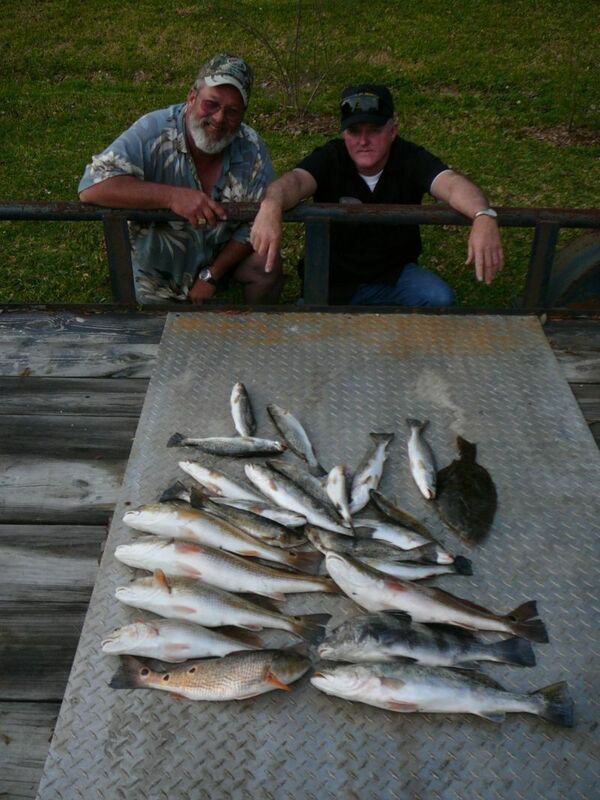 On Friday March 28 Randy W. and his longtime fishing partner Gene made the 2 hour trip from Houston over to Lake Calcasieu to get in on some Spring action. And in between their cutting up and stories (and the fact that Gene tried to throw his rod overboard)we actually found time to catch some good fish. Sam D. , and freinds Gene and John made the trip from Houston. We started the day with a lot of bites but mostly 12 to 15″ Reds and Flounder. Gulp under a cork put a couple of 3# reds in the box and a live mullet got John a battle with a nice 4# speck which gave me a chance to show off my netting skills. 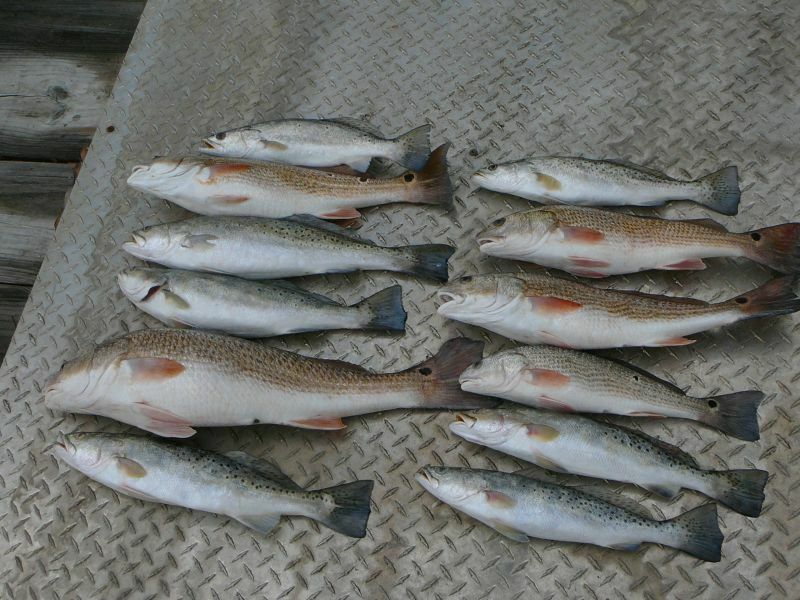 After a couple more smaller trout and we sought shelter from the 15+mph winds in the marsh and using dead shrimp got some good Reds to Bite. Unfortunately the bigger Reds won most of the battles and left our tackle in shambles some of it still floating in the marsh. 3/16/2008 George G. of Houston Makes his 2nd trip this year . George G. of Houston made his second trip of the spring to join Captain Tom on his 24′ Triton for an enjoyable day on Big Lake. With 15 to 20mph winds that 24ft boat came in handy and so did Georges computerized Shimano Reel. It handled the wind and the fish with ease. 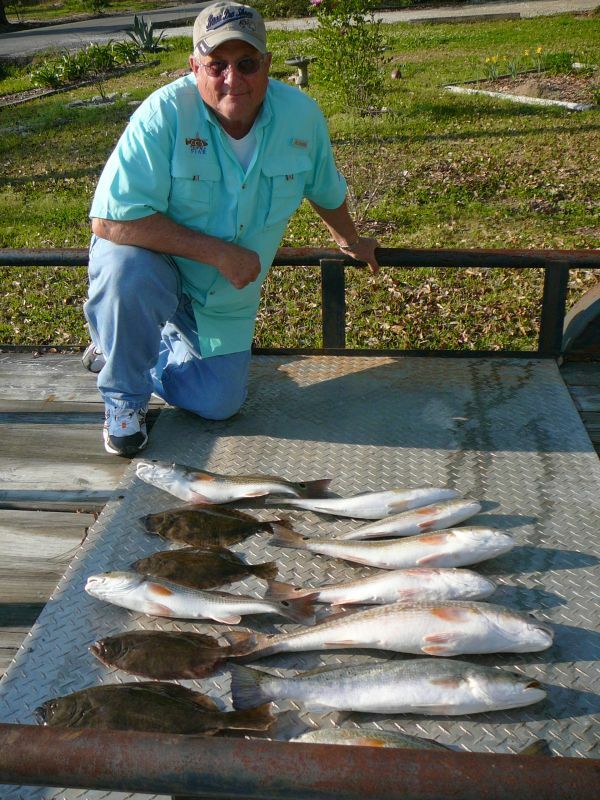 We managed 7 reds 5 flounder and 2 trout for the second Big Lake Grande Slam this week. George said he’ll be back for trip #3 next month. 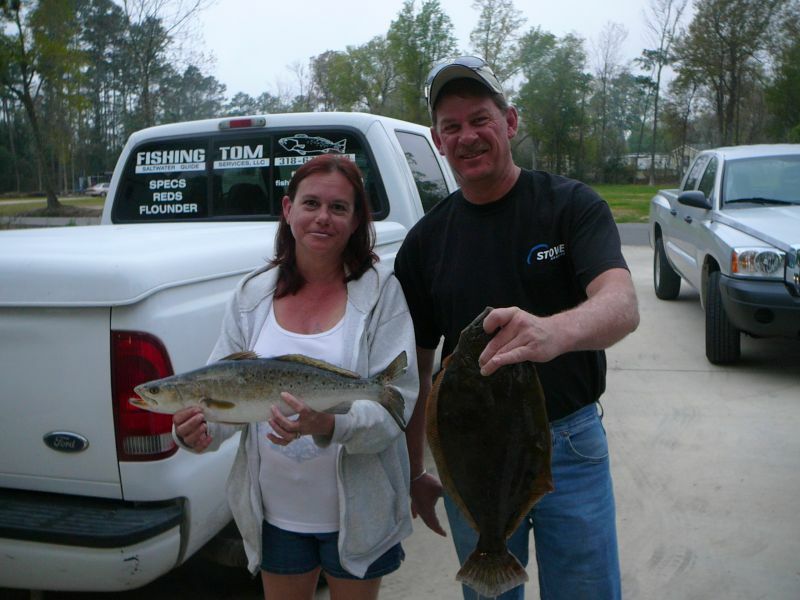 Thursday 3/13/2008 Jim & Kim R. of Minden managed inspight of strong March winds to Catch trout, Reds, Flounder and a Black Drum to boot. All were in the 3# Range. Live Finger Mullet was the key to their their Grand Slam. Great job guys.